In 1811, New Madrid, Missouri was shattered by a series of massive earthquakes. For weeks, the shocked citizens coped with a world gone mad. They all changed, fell apart, and endured. This is a fictionalized account of the true story of a family and a town who faced the terror and hardship of unthinkable, prolonged natural violence with courage, love, and even humor. 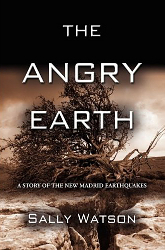 Long Description: This is a story of the New Madrid Earthquakes of 1811. When Matteo Bagliolo, beloved of le bon Dieu, arrived in Missouri in 1811 to take up his inheritance with his adoring wife Monique, two spoiled children and a young maidservant named Fleur, he confidently expected to find even more luxury than he had left in La Belle France. A chateau at the least, with fountained gardens and an army of servants. He was mistaken about that. It was a fine two-bedroom log house with no servants at all, in a frontier town of perhaps 600 French and English-speaking folks who expected every tub to stand on its own bottom. They also were mistaken. Perhaps it was that unnerving comet that had covered a quarter of the sky for months, with no one able to agree on whether it was God or The Electrics? More likely it was merely that the Bagliolos were incapable of doing anything of the sort. Matteo in turn expected the natives to revere him and produce servants, his wife and daughter to be fine ladies of leisure, and twelve-year-old Fleur to clean house and produce gourmet French meals. But all went wrong. His son Rudolph whined and gorged to comfort himself. The townsmen, disrespectful, declined to become his servitors. Fleur could not even begin to manage–and began to entertain wild animals, a half-breed Indian and subversive ideas about Liberté, egalité, and the pursuit of happiness. Monique, forbidden to help Fleur, became a slightly-turning worm, and daughter Caro flirted with even the most ineligible young men (except for the arrogant Charles-Auguste). Among them they alienated most of the neighbors. In short, everything simply disintegrated. On the night of December 16, 1811, Creation burst apart with a roar, in the first of the most violent earthquakes ever to hit America. The earth bucked and split, trees toppled, waves of earth could be seen rolling across the land, lightning zoomed, sulfurous fumes choked man and beast, the Mississippi River went insane, and so did all the animals and birds. The harbor was a shambles. All homes were instantly and permanently rendered uninhabitable, so that they lived “under quilts” outside in a permanent camp for over a year….for it didn’t stop. In eight weeks there were thousands of quakes, some felt for a thousand miles around: four of them estimated as between 8 and 9 points. The shocked citizens, driven from their homes, faced a world gone mad. They had little choice but to face it. Some rose to the occasion, some didn’t. Some tried to flee the area–but where? And how, with trees falling and blocking all roads? Matteo fell apart. Monique discovered long suppressed qualities of leadership in herself–and began regarding him with the same disrespect he had always given her. Caro tried to reform the irritating Fleur. Rudolph ate more than ever–and then, suffering mal de terre, threw half of it up again. Eliza Bryant managed to write a detailed journal. Charles-Auguste discovered himself to be a coward–but “assumed a courage if he had it not” through sheer pride. Zeke bawled for all to Repent, and baby Linette thought it all a game invented for her amusement. Mme. Du Lyons said things hadn’t been so much interesting since one fled France two steps ahead of Mme. La Guillotine. Except for two, they all endured, somehow. This is the story of a family and a town, some half of them historical characters: how they faced the terror and hardship of unthinkable prolonged natural violence, found courage, love, even humor.